Two days ago, I made the family... ok, myself... some no-bake cookies. I was craving something sweet yet with some nutrition to it. Oatmeal is good for you! Peanut Butter is good for you (well. the all natural kind, which I used)! Cocoa is even good for you... ANTIOXIDANTS PEOPLE! Hello. Ok. Ok. So the butter and sugar are a bit much... BUT STILL! Probably the healthiest junk food I could have made myself. I was tweeting about this yummy goodness and Suzy from over at It Walked On My Pillow declared that her recipe doesn't include Peanut Butter. I was shocked! A No-Bake... WITHOUT PEANUT BUTTER! That's like Hot Chocolate without the Marshmallows. Somethings missing, ya know? For her sake I wanted to share a very simple, very common recipe for No-Bake cookies... WITH PEANUT BUTTER! Because Chocolate and peanut butter = best food combo EVER. Don't even argue. First thing you will want to do is lay down a long sheet of wax paper. This is where you will put the cookies to set. Next you will take the Oatmeal, peanut butter, and vanilla and dump them in a large bowl that is heat safe. 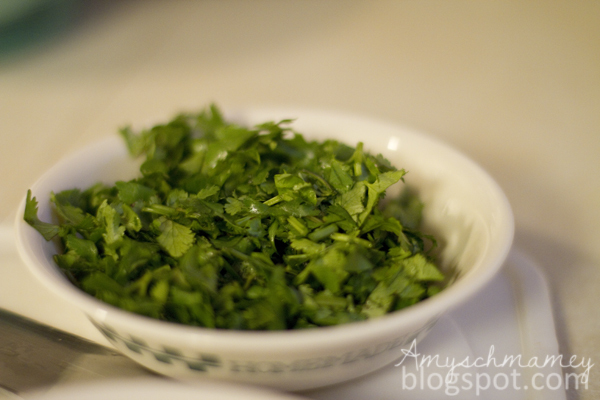 Then you will bring the first 4 ingredients to a boil while constantly stirring. Once mixture has reached a boil, boil for 1 minute. After that minute is up, pour this into the bowl with the oatmeal, peanut butter, and vanilla. Stir well. Then you can either use a regular spoon or I like to use a small ice cream scoop and drop spoon fulls at a time onto the wax paper to set up. It takes about 30 minutes to set enough to eat... but generally it takes about 1 hour to cool and set. I'm usually impatient and help myself after about 15 minutes. GET IN MY BELLY! Well. There you have it. A tried and true recipe for No-Bake cookies. Enjoy! My Life is Going Crazy. Well, isn't that a dandy. Most of you know that Dave and I weren't planning on having anymore kids. I never thought I would ever see a positive pregnancy test for the rest of my life. Yet, here it sits. On a counter top. 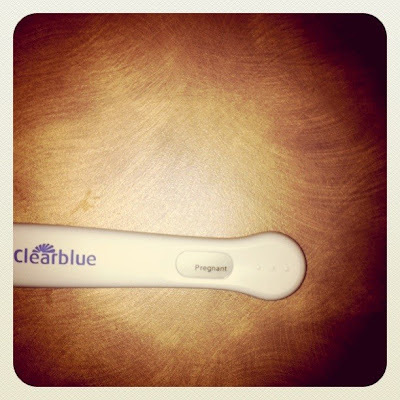 Telling me I'm pregnant. I admitt. My first reaction was less than glamorous. I didn't cry. I just pouted, and pouted, and pouted some more. See. 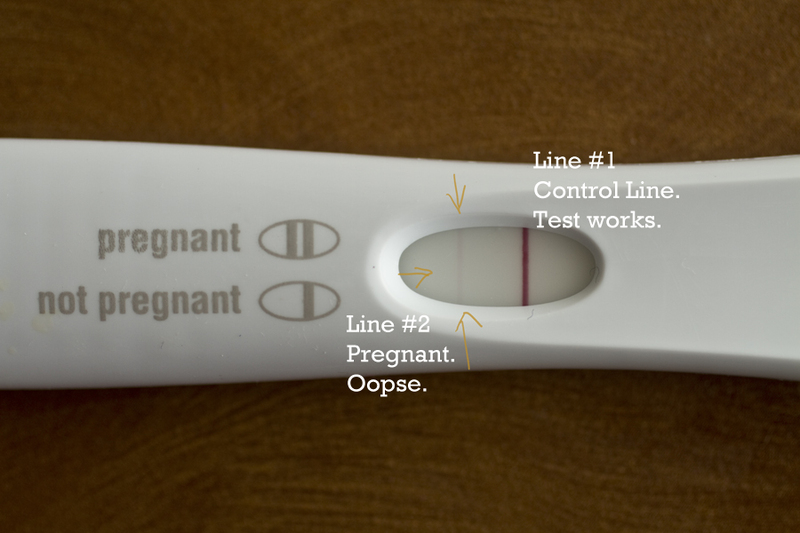 I know that there are many women who struggle with fertility and more than likely despise people like me, who really could live happy without seeing a BIG FAT POSITIVE result on a fortune telling pee stick. While I really wish I could give my fertility away, I can't. Just like, I can't help but react the way I did upon seeing the results. Meh. Pregnant. Yup. BUUUUT!!! You will be pleased to know, that since taking this test I have actually grown a little bit of excitement, nay, I say even a little bit happy??? I mean. It's early. I am 4 weeks 5 days along. EDD 11/29/2011 RIGHT AFTER MY MOST FAVORITE of holidays, Thanksgiving. See? There is reason to be joyous. What a great time of year to have a baby? right? Well. Still. I am only 4 weeks and 5 days. Most people wait until their 14th week to tell a living soul that they are expecting because of the high possibility of miscarriage in the 1st Trimester. I, however, have never waited to tell anyone. I have always been the one to take the test and tell everyone. No exception with this one OBVIOUSLY! ha. So, now you all know. It's the beginning of a new adventure on my blog. God willing that I carry this baby full term to delivery and the baby is perfect and healthy, you will be getting "How fat is Amy getting?" updates... ok. Not really. I will probably be doing a weekly or monthly feature on it. Fun stuff. I love me a good hot bowl of chili. The way that I make chili is very healthy. Well, at least I think so. It's also rather delicious, so I thought I would share my recipe. It's so simple. 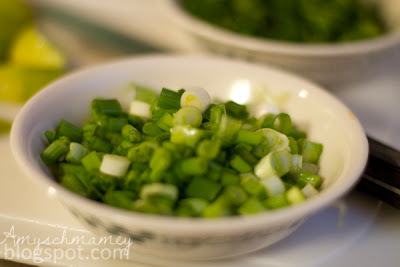 1 bundle of green scallions. 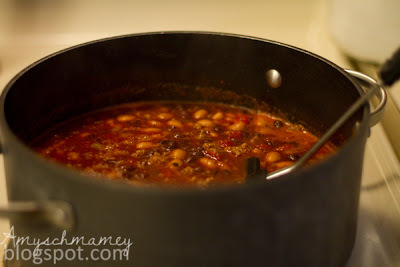 The best way to make this chili I find, is to bring all the ingredients together on the stove then dump into a crock-pot to simmer all day. So good. Anyway. Here is how I do things. First brown your meat. Once your meat is browned add the Fire Roasted Diced Tomatoes and Green chilis and tomato sauce. While that is heating up with the meat drain and rinse your canned beans. After they are thoroughly rinsed dump them in the pot with the tomatoes and meat. Begin to add your spices; chili powder, cumin, salt, garlic. Add a cup or 2 of water. Bring to a boil. Now you can either put a lid on this and let it simmer for 30 minutes, or if you have planned for it to cook all day, dump the contents of the pot into a crock-pot and let cook on Low or Medium Low setting until you are ready to eat it. While the chili is cooking mince up your cilantro, slice your lime into wedges, and chop up your scallions. Set them aside in seprate bowls. When serving the chili, it should be topped with shredded cheese (unless you are lactose intolerant like my husband), cilantro to your liking, and green scallions to your liking. 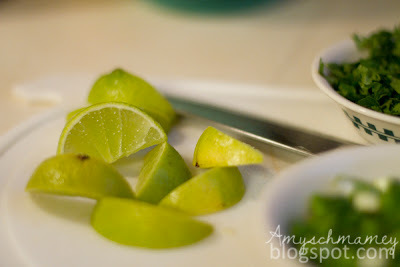 Squeeze the lime on top of all this and you have a delicious blend of flavors that hopefully will have you saying mmmmm with every bite. We also like to eat our chili with tortilla chips. We either use Baked Tostitos or some all natural ones.